Custom website redesign for a top Los Angeles law firm, Freedman + Taitelman, LLP that is focused on entertainment law in Hollywood. This website was a part of F+T’s rebrand launch which also featured a new corporate logo and corporate colors. 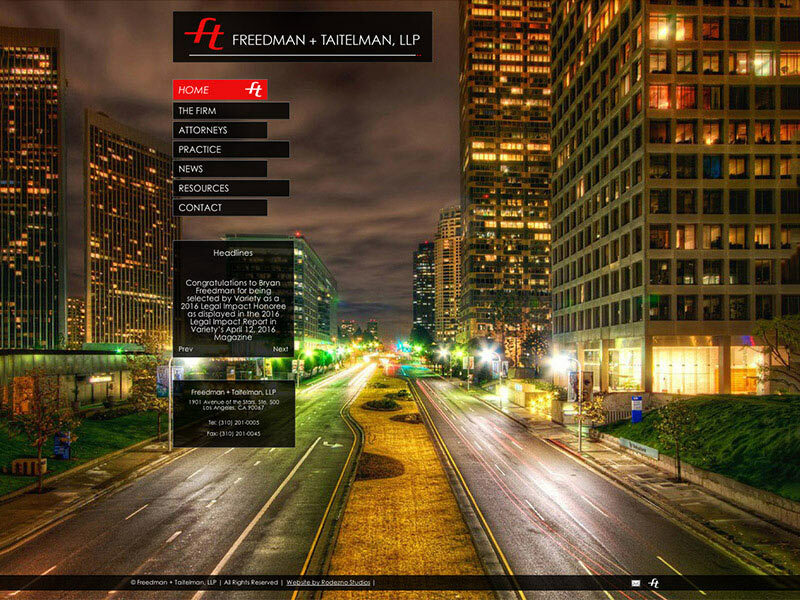 Bryan Freedman and Michael Taitelman founded Freedman & Taitelman, LLP in 1997. Since that time, the firm has grown carefully, adding only high-quality people to its roster of attorneys and staff. Today, our clients range from individual entrepreneurs to Fortune 500 corporations, from local businesses to publicly traded corporations. We have the breadth of experience to tackle our clients’ legal problems, from the day-to-day legal questions to the make-or-break case. Client needed a web site redesign to update the look of the web site and rebrand their law firm. The client also wanted a minimal design with strong imagery to further connect their law firm to Los Angeles. Services Provided: Website Design, Website Development, Digital Content design & strategy, Digital Marketing, Photo Selection, Custom licensed photography & Branding.